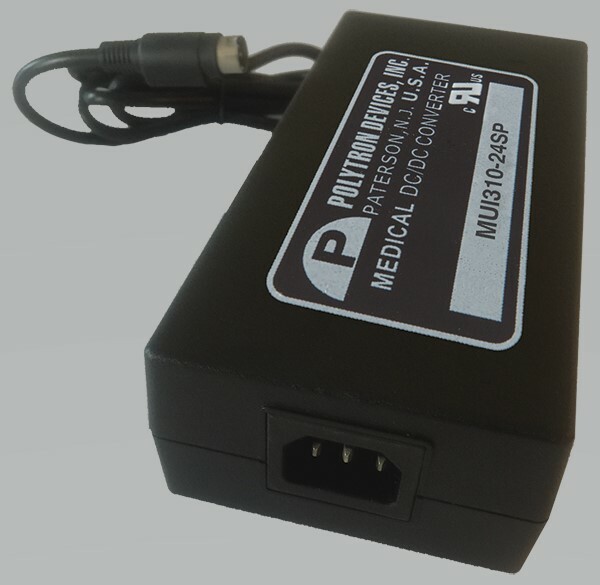 Polytron power supplies are UL approved power converters designed specifically for use in the medical field. Our DC-DC and AC-DC power converters have been approved for safe use in medical applications, including medical equipment in close proximity to hospital patients. Polytron’s power electronics for the medical sector all comply with the strict standards of the International Electrotechnical Commission (IEC) – specifically the requirements of IEC 60601-1, the main standard for the safety and performance of electrical medical equipment. To meet the IEC’s requirements, all of our medical equipment has two means of patient protection (2 X MOPP). Our medical products have isolation voltages of 1,000 Volts above IEC 60601-1’s minimum requirements, and they also prevent electric shocks to user with low leakage currents. DC-DC converters are offered in 3, 6, 10 and 15 watts. We offer single and dual output voltages. AC-DC converters are available up to 450 watts. We offer single, dual and triple output voltages. Power density for DC-DC converters is a dense miniature package of 0.80 x 1.25 inches with a height of 0.40 inches. DC-DC converters have an extra wide 4:1 input range with either a 9-36 Vdc input or a 18-75 Vdc input. DC-DC converters can either have a printed circuit board map with pins coming out of the bottom that plug into the board or a surface mount for automated assembly. A chassis mount to bolt down to a board and wired through its terminals. An enclosed type has a PIN for through hole mounting. A DIN rail mount that clips can have wires connected to it and has an adaptor that fits into a metal frame. Our DC-DC converters support an optional on-off pin, an added safety feature rarely found on competitive products.